You have to try this super easy and delicious take on pancakes. They are perfect for meal prepping or serving to your family. Plus, they’re also Gluten Free. Made in partnership with Bob’s Red Mill. 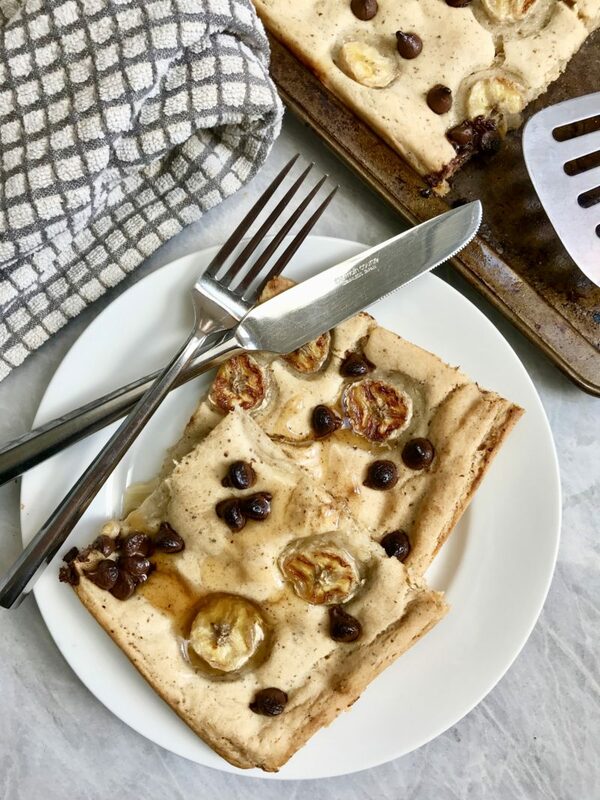 I’ve seen this trend going around for these easy Sheet Pan Pancakes. 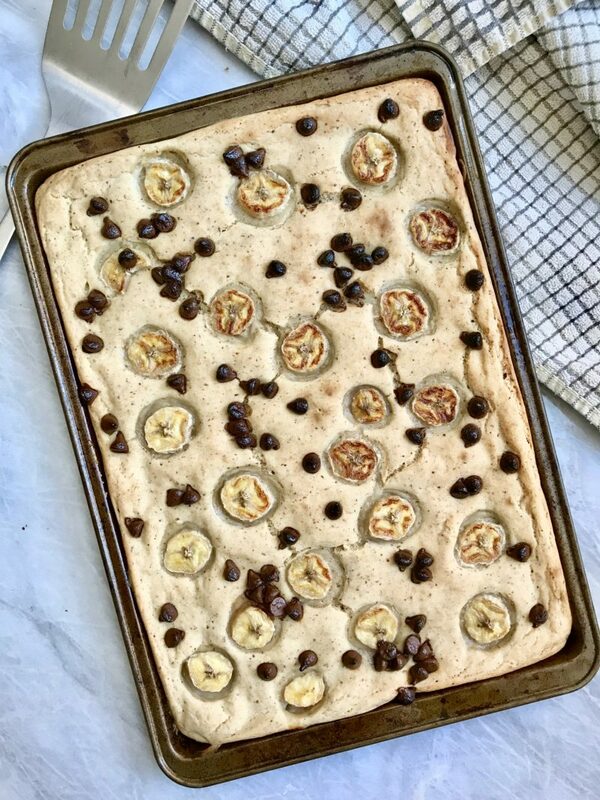 It’s basically homemade pancake batter put onto a baking sheet and then baking it! They come out with a super similar pancake texture but are easy to make in one go and saves time. They are also great for meal prepping for the week or freezing for future use! I’ve been asked to post more gluten free/friendly recipes, so I decided to start by making this entirely gluten free! I used the Bob’s Red Mill Gluten Free 1-to-1 Baking Flour. In my opinion, this Bob’s Red Mill gluten free flour is the best on the market! While I am not gluten free, I understand how allergies can seem to get in the way of things. As someone who is allergic to nuts, it can be hard to find a lot of recipes that you can enjoy. I wanted to make sure those of you who are allergic to wheat or have an intolerance can enjoy this delicious recipe. For over 30 years, Bob’s Red Mill has been committed to having the best gluten free flours on the market. They have a dedicated gluten free facility meaning that you don’t have to worry about cross contamination. As someone allergic to nuts, It’s really easy to appreciate to see a company who becomes dedicated to helping those with allergies. Learn more about their passion for serving quality gluten free products here. Bob’s Red Mill is one of the best companies available. They have a load of gluten free/non gluten free products and are very easily accessible. I love that I can walk into a regular grocery store (compared to specialty) and still be able to purchase their products. When it comes to the toppings in this recipe you can use whatever you want! 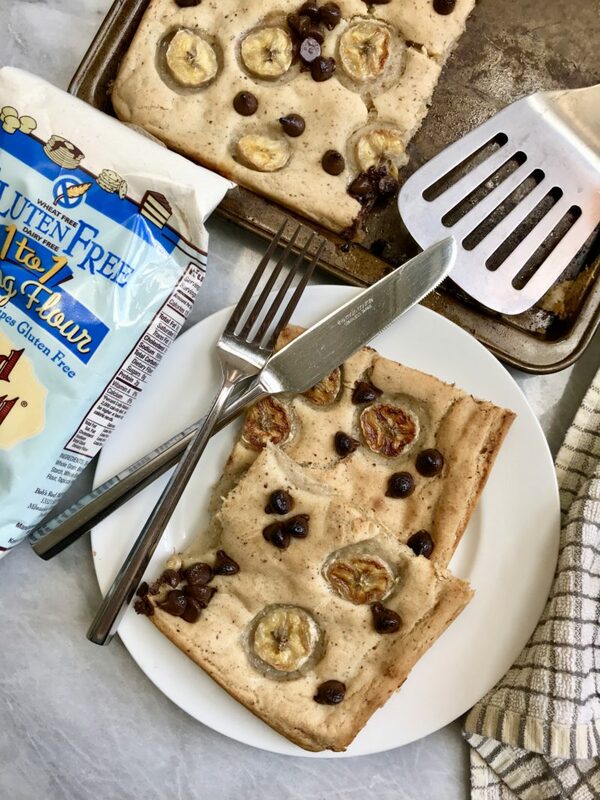 I personally love a good banana chocolate chip combination so that is what I went for! However, this would be great with mixed berries or other fruit combinations. You can top your sheet pan pancakes with whatever toppings you’d like. I decided to add some maple syrup but you can also add vegan whipped cream, powdered sugar or some sunflower butter/nut butter. If you make any of my recipes, don’t forget to tag me on Instagram @plantbasedjane. Before mixing your ingredients, prepare your flax egg. In a small bowl, combine 2 tablespoons ground flax seed to 6 tablespoons water. Mix well and let sit for exactly 10 minutes. Combine your flour, coconut sugar, baking powder and salt in a large bowl. In a separate bowl, combine your plant milk, coconut oil, and flax egg. After 10 minutes, your flax egg will look gelatinous. This will help bind all the ingredients together. Combine your wet with dry and mix to combine. Add to a greased 9x13 baking sheet (I used spray avocado oil) and evenly distribute all of the batter on the baking sheet. 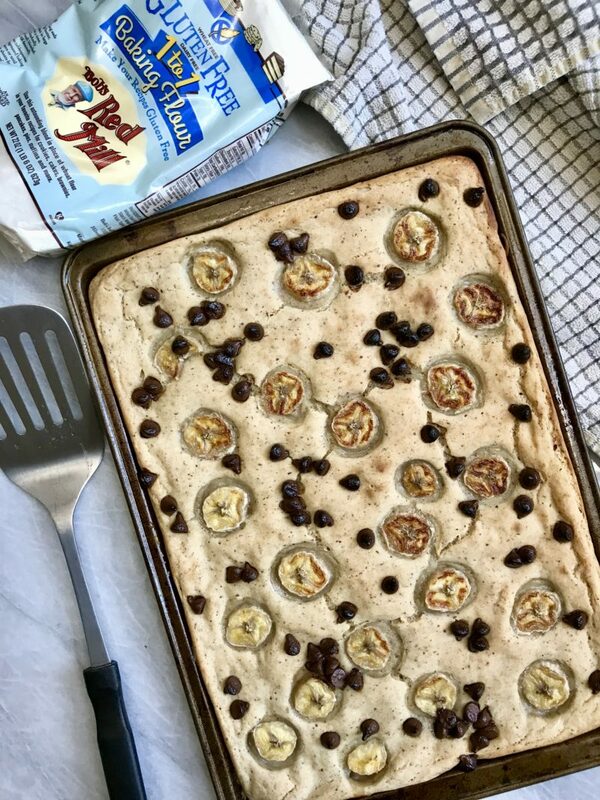 Top with your banana and chocolate chips. Bake for 15-18 minutes. After 15 minutes insert a toothpick into the center. If it comes out clean it is ready but if the batter is a little wet on the toothpick then let bake for an additional 3 minutes. Optional: To get a little more browning on your pancakes, turn the broiler on high after they're done cooking. Let cook for 1-2 minutes and remove from oven. If the top of the pancake feels hardened just wait a few minutes and let cool. It will soften right back to a pancake texture. *You can freeze this in a freezer safe bag for up to 1 month. Thanks so much to Bob’s Red Mill for sponsoring this post. It means a lot to me to work with brands I love and support my blog.